Presented by Professor Zhaoxiang Wang (Institute of Physics, Chinese Academy of Sciences). Lithium-rich manganese-based oxide (xLi2MnO3(1-x)LiMO2 or Li1+xM1-xO2, M = Ni, Co, Mn, etc) are regarded as one of the most important candidate cathode materials for high energy-density lithium ion batteries. All the merits and drawbacks of these oxides are closely related to the Li2MnO3 phase or component. Therefore, the structure of Li2MnO3 or its replacer has to be optimized in order to improve the electrochemical performance of the Li-rich oxides. This talk introduces key findings on stabilizing the structure, thus improving the performance of the Li-rich cathode materials. Our first-principles calculations indicate that the distortion of the MO6 octahedrons in Li2MO3 (M = Mn or Mo), due to generation of oxygen vacancy or change of the M-O bond length, triggers the migration of the transition metal ions and structural and performance degradation. On the basis of density functional theory (DFT) calculations, we proposed Nb, Sb and Ti as the doping element to improve the stability of the Li-rich materials. By fabricating a surface layer of a few atomic layers thick in which the 3b-sited lithium is substituted with these heavy atoms, Li-rich materials with high specific capacity, high retention of the reversible capacity and discharge potential are obtained, thanks to the oxygen-capturing effect of the modified surface layer. Other strategies on stabilizing the structure and performances of the Li-rich materials will also be discussed in this talk. Professor Zhaoxiang Wang received his PhD degree at Institute of Physics, Chinese Academy of Sciences (CAS) in 1998. After this, he worked as a postdoctoral research fellow in Mie University (Japan), University of St Andrews (UK) and University of Michigan (US). He joined the Institute of Physics CAS in 2000 and has been working there ever since. 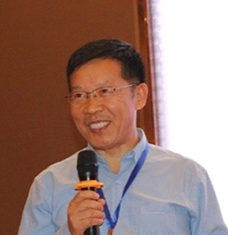 His research interests include the structural design and properties prediction, synthesis and characterization of the battery materials, the charge transport and other physical and chemical processes in the bulk and on the electrode/electrolyte interfaces.